Home > KMS	> kMS ver. 1.2.189 – Golden Week and Cash Updates! kMS ver. 1.2.189 – Golden Week and Cash Updates! Well it’s been a while since the last patch in both Tespia and the real server, and we still don’t know the next Cygnus to be updated (although the patch will be on March 21!) so I decided to do a sort of filler post haha. It includes a small event that was added as well as all the new Cash items that were added this month that I thought you guys should know about, since I usually skip over them. Also, my friend Andy (Asinine) has reached level 201! Congratulations~ I don’t think he’s going any further though, haha. Oh yeah, I misread the patch notes a while back, you DO gain 5 AP when levelling past 200, just no SP. Speaking of level 201, take a look at this. That character is a rogue (first job thief), haha. The powers of leeching! 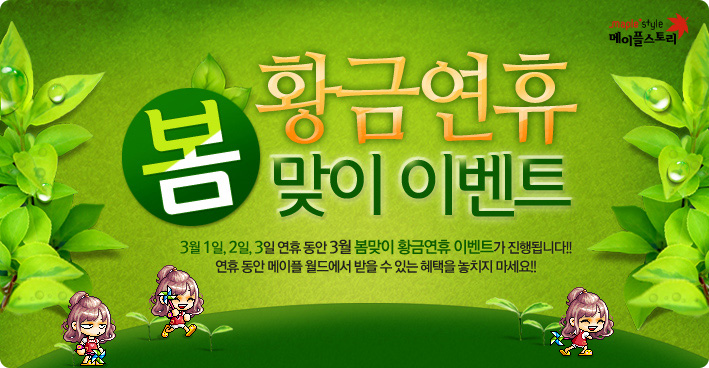 The event that came out is the Golden Week Spring event, and runs for only three days, from March 1 to 3. Every 10 minutes, you can collect 50 Pinwheels from monsters for Cassandra to receive either a Chaos Scroll or a 20 attack/magic attack buff. Also, you can log in each day to claim free prizes! On the first day and second day, you’ll get a 1 day title that gives 3 attack/magic attack and 5 all stats. On the third day, you’ll get a 90% weapon scroll that adds 9 attack/magic attack and 3 to all stats as well as a 14 day version of the title beforehand. On to the Cash items! This one’s not really important but I thought it was cute, a new hired merchant, this time a panda! 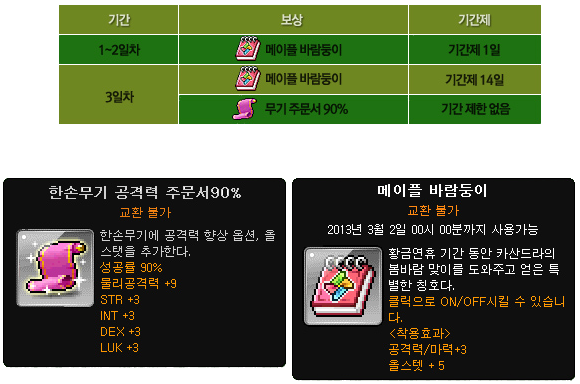 A new item called the Maple Royal Style coupon has been added, for 2,200 NX. Using it gives you a random Cash equipment from a set (the set changes each month). What’s interesting is that the equipment will have stats!! Above you can see the weapon cover, which gives 10 attack and 1 magic attack! I’m not sure if they all give the same stats, if its random, or if any of the other ones even give stats, but still… wow. However, the stats of the Cash item will expire in a certain amount of time. You will then be left with just the item, no stats. 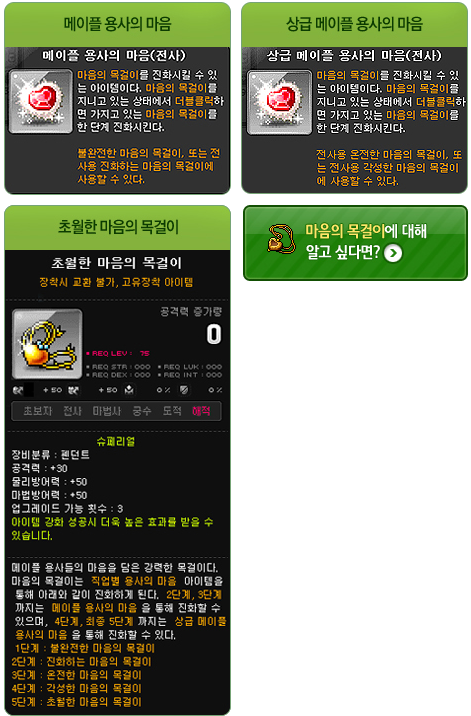 In the past couple of months, Nexon has released a crapload of those etc items that need a Cash item to be opened! As you can see, everything from after the Slime and Mushroom Omok Set to the Herb Bag are all these items, it’s crazy. One of the most recent of these is the Magic Harp. It costs 1,900 NX and it’s just like any other of the ones above like Peanut Machine, ice cubes, or feathers, but it has something extra. This is the Fever system! Every time you use a Magic Harp, the Fever Gauge will go up by a bit. Once it’s full, the next Magic Harp you use will give you a special item! They even have Double Fever Times (like Double Miracle Times), where the Fever Gauge will go up by twice as much if you use one. 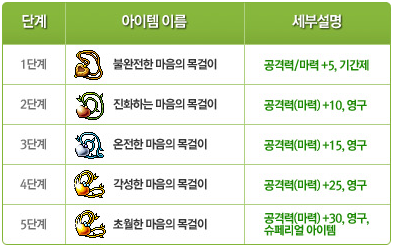 The special items for the Magic Harp included scrolls, flames, Timeless and Ultimate equipment, as well as the new Scarlet weapons, which I talked about in a previous post. 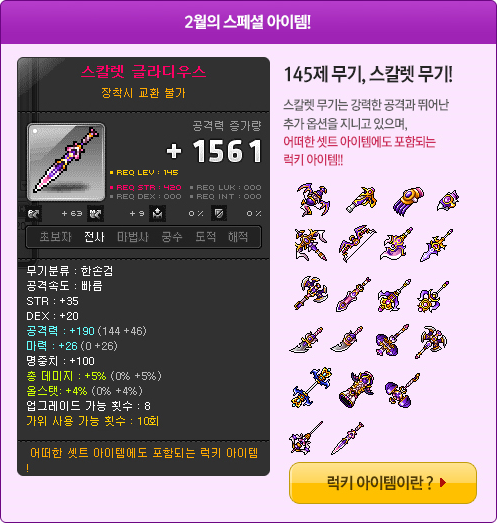 These are level 145 Lucky items, meaning they can take the place of another weapon in any set. Just a few days ago, they released the New Magic Harp, which also costs 1,900 NX. It also uses the Fever system, and you get a Warrior’s Heart Piece when you use one (this will be important later). You can trade in 20 for a Normal Warrior’s Heart or 50 for an Advanced Warrior’s Heart. Again, you see those Warrior’s Hearts! What are they for? They’re for the new Maple Heart Pendants! When you log in, you’ll receive a Heart Pendant. Collect a Heart Pendant’s Chain from monsters and combine them to form the Incomplete Heart Pendant. You can then use the various Hearts found from the New Magic Harp’s Fever prizes to upgrade it! 90% scroll for +9 atk. 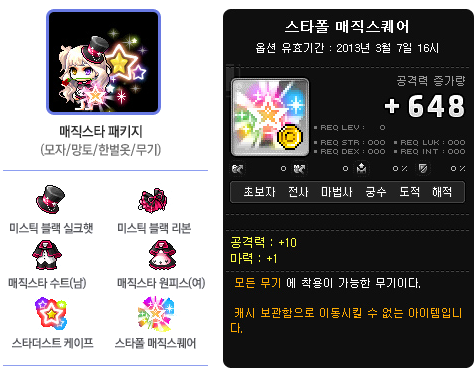 What the hell nexon? Break the game more why don’t you? Lol you just created an username to do that? Wow that 90% scroll is epic 😀 Lol Wonder if you can mix it with a lucky scroll. 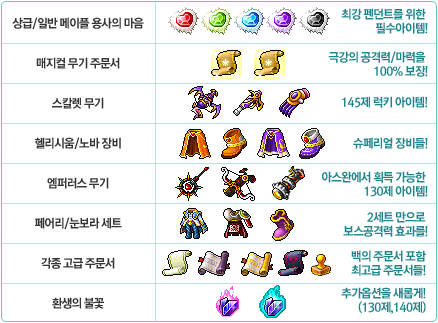 Gms had an event with pendants looking like those but not nearly close as good. Lawls I really like the new Scarlet weapons 🙂 Does the new commander have a name yet? Nope, we only know her as ‘the one who can control dreams’. eeehhh. I want an explorers revamp. Originals should be the strongest…. Hmm.. Just events, lol I wanna know about the next update. Ah, the Black Mage is running out of commanders I guess. How many more substitute commanders is he going to get? iirc, Demon, Guwaru (after being resurrected), and Orchid defected. Not sure if Lotus is still serving as a commander considering he’s just a puppet of Gelimer or whatever, and Magnus left to work for Darmoor. So would the Black Mage be getting like, four more commanders (Damien and this new girl included)? wow, all that atk boosting stuff. Are those Heart Pendants tradable? They’re tradeable until you equip them. Nice post and that “One who can control dreams” story in the link was very helpful and….Deep…. So Max, you said the next patch is going to be on the 21st, is that for Tespia or the official server? The Dream Manipulator? I thought the story line said Arkarium make the gate to the future to freak out Cygnus? Max, in that picture of your friend, did he get +5 ap after reaching lvl 201? Oh yeah I forgot to mention, you DO gain AP after levelling past 200, just no SP! o, is it still 999? or did they increase the stats cap? Are the items from the Maple Royal Style coupons permanent or do they expire after 3months? 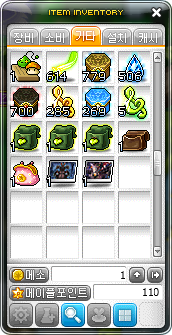 Do the items from the Maple Royal Style coupons expire after 3months or are they permanent? The equips are permanent, the stats are not. He didn’t leech! He trained for many hours for many days to level up. dayum. Anyone played Kanna? How’s the job? I would actually love if the where more CS updates, to keep track on what I would like to buy in the future. I’m glad we will actually get something for leveling passed 200. For weeks, the entire GMS community that doesn’t play KMS has been talking about how 201-250 is pointless until this. Nice one, Max xD. Another thing: I really hate all this events with the etc item needing a cash shop item to open them for good stuff. It really gives people who want to/can buy NX a clear advantage. 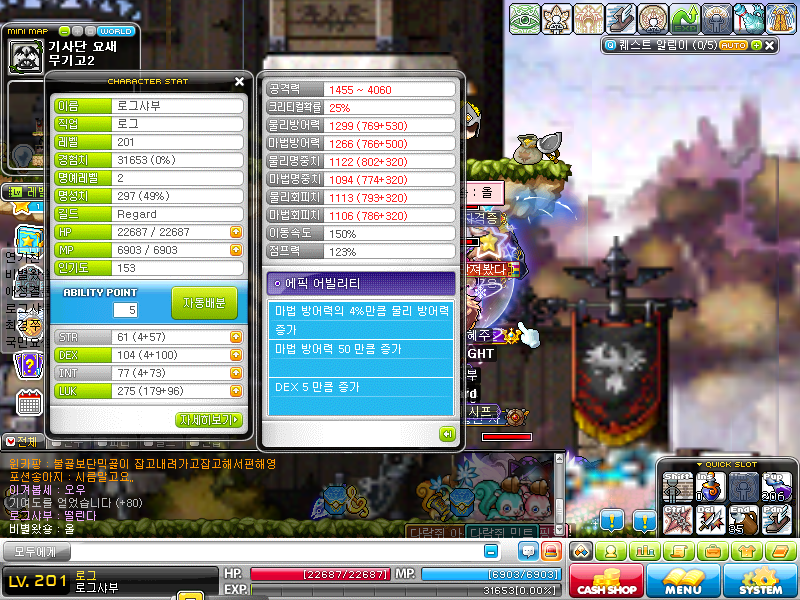 I know nexon is money hungry (especially GMS), but it’s still really annoying. especially GMS? no! is especially MSEA! see http://maple.asiasoftsea.com/index — MSEA website, how many context about cash i cant count…. Can you hear it ? That cracking sound ?? Yeah, the game is breaking apart..
What Hair is Asinine using? wait, did they increase the stat cap? otherwise that extra ap won’t help much. Question, didnt the explorer weaken the black mage, then the heroes were able to beat him down?? Thus explorer should be STRONGEST@! According to the plot classes similar to the explorers we now have were used as soldiers against the black mage’s army. 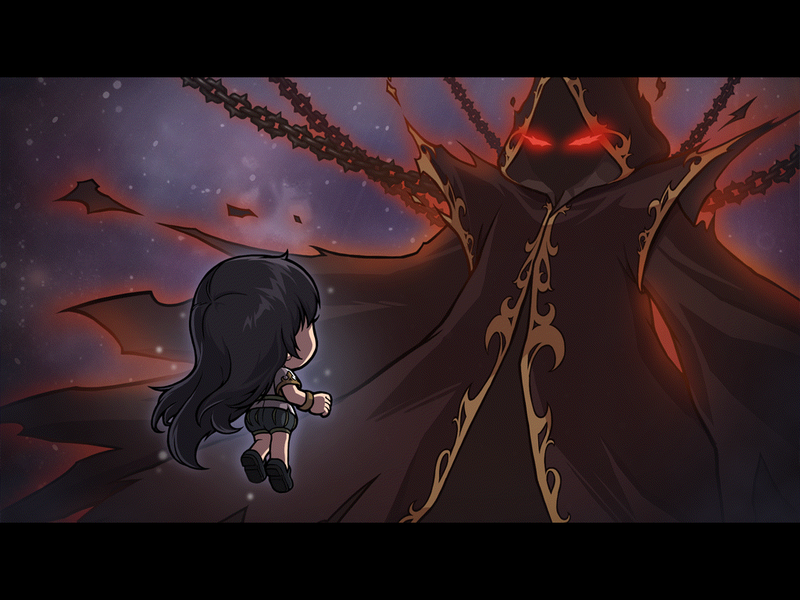 Demon slayer/avenger is the one who weakened the black mage for the heroes. Explorers were formed right after the Black Mage was sealed. Max,about this sentence “90% weapon scroll that adds 9 attack/magic attack and 3 to all stats as well as a 14 day version of the title beforehand”，what does “14 day version of the title beforehand” actually mean?will this scroll expire?or another meaning? How hard is it to get the hearts needed to upgrade the necklace? Are they very rare and expensive or moderately so in price and distribution? 90% attack +9 scrolls and cash for stats…. Max, for that log-in event thing to get the 9 attack/m.attack 3 all stats scroll is there a level requirement? Also is it class specific? So if you’re doing it on a luminous will the luminous be able to pick from m.attack or attack? I’m wondering about this too. You have to be level 13 I believe… and I think it goes by what weapon you’re wearing at the time? It’s either that or the job… I’m not sure, I always get a 2-handed attack scroll on my Bowmaster but I’m always wearing a bow. one last question, and i hope you dont mind. but is it one character per account? or does this log in and grab event go for all characters on the account? Max, that 90% scroll gives both magic and weapon attack or we get the Magic if we claim on a Magician, and Attack if we claim in a non-magician class? kMS ver. 1.2.190 – Small Changes and Events! kMS ver. 1.2.189 – Cygnus Returns: Wind Archer!